Weboptimeez - Articles about how- to Measure, Analyze and Optimize your website : analytics, optimization and user-oriented! It’s been a few weeks since summer is over and we are now in Back to School mood, showing off our nice pic and how tanned we are… And here comes the fateful question “What did you do this summer?”. Well, now that I am a full grown up and am living in Asia – I don’t really get this feeling of end of Summer in September, as it’s still 30 degrees in Hong Kong and it’s not going to stop before November approximately and I don’t really get the fateful question anymore as in Asia July/August are month like any other ; the activity is not slower. Anyhow, I don’t blog in July/August and treat September as my Back to Blogging month. And instead of showing off how tanned I am, I’ll show off how studious I was this summer and share 2 books I read during my trip back to Europe this summer. I had this book since a while in my bookshelf, over 5 years to be honest – eyeing me and vice versa – I finally got to read it ! Holidays and long hours flight are the best. Even if it has been published a while ago, Web analytics, one hour a day is a great book full of insights, supposedly destined to beginners but even for advanced analytics expert I believe it’s always good to take a step back and make sure that you master your basics. As this is still 400 pages to digest, and my memory would never be as organized as my Mac, I took some notes and highlighted my favorite passages of the book along the way so that I can make a book report of it later. Statistical significance and Calculating Control limits: We are often challenged by our clients about the data, there is deep feeling of mistrust around the data delivered especially when the results goes against a personal opinion. And even if you are not challenged, it’s should be a core part of your own work to challenge your results and be absolutely convinced by what you are presenting. In diverse part of this book, you’ll find tools and examples of how to achieve this and rely on tangible tools to demonstrate how much your data and reports can be trusted: statistical significance calculator, sample size calculator… are some of them. The title though quite self explanatory do not give the full view of what to expect. In 168 pages, you will go through a pretty comprehensive view of steps and consideration to have when embarking into a customer centric approach to pilot your business. Summary In their own words, the purpose of this book is to “enlighten analytic minds to the power of a fully coordinated effort to use multi-channel data to drive insights, measurement and decisioning that create optimal outcomes“. This book covers multiple notions essential to achieve this goal: best practices to capture data in a multi-channel, multi-devices/screen world, pitfalls that you’ll encounter but also top notions and basics to master before kicking off a customer centric project. Which parties should be involved, at what time and why… How to work with your IT folks, which tools and strategy to consider (MMM, Attribution, Segmentation, Optimization and Testing) etc… How different media channels are connected and what can be achieved in this mindset. Effective email data integration strategy, this section emphasis the importance of email data. Emailing being one of the best tool to capture individual information with the conscious agreement of the person ; it’s crucial to take advantage of this channel to better connect offline and online data. Even though emailing often comes at the end of the journey this is the chance to maximize knowledge of our customers. Mix modelling and Attribution: Top down versus Bottom up approaches. This section covers both approaches and how each of them contribute to measuring your marketing performance, but also the limitations of each of those solutions and how bad interpretation/utilization of those tools may conduct to bad media optimization strategy and why market research can supplement to a combined approach for a better “truth”. I really enjoyed those 2 books for 2 major reasons : (1) The concept and examples are really close to real business questions we have as digital analyst, both books rely on real-life scenario and do not bore you with new fuzzy and trendy concept that won’t help your daily working life. Also those books provide tools, links, how-to, case studies… you’ll finish your reading with a sense of having learnt something new and having the tools at hand to apply it (2) No linear reading. You can cherry pick the topics that interest you and read only 2 chapters if you want, although I will suggest to read it all, some chapters may not be relevant to you either because you already master it or because you just don’t need that level of details. Hope you’ll enjoy the reading ! Analytics Trends Weekly review: Digital Attribution Rubik’s Cube ! Good news being that we are not looking for perfection but a model which is as reliable as possible for your business, which will enable to measure afterwards your campaigns adjustments and optimization moves lift – and understand which spends to which channel impact actually your bottom line KPI. Models won’t be the same for each business ; the level of complexity required is inherently tied to your business model and your customer path to purchase. To keep it simple, your goal is to know if you are spending wisely : your attribution model is the ground for testing your spends strategy. I have been away for a few weeks holiday and tried to catch up with the latest articles about it since my latest post on “Fun with algorithms: Attribution and media mix-modeling” and the 2 latest acquisition (Adometry by Google and Convertro by AOL). As the list was piling up, it seems to be the perfect time for a best-of articles. Has Google sold billions of dollars in ads that don’t work? Do You Actually Have an “Attribution” Problem Worth Solving? 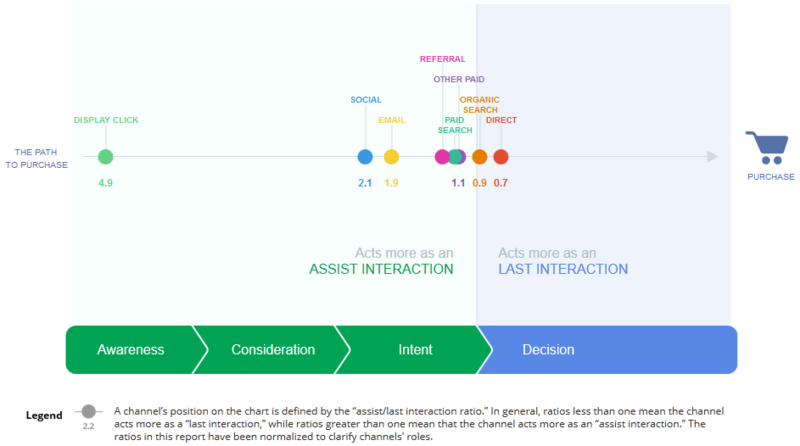 In my opinion, Attribution is still at his early stages thus it’s a really exciting moment to work on this as everything can still be defined, new definition, new rule, new way of thinking, new best practices… If you consider moving from the last click attribution to a data-driven / customer journey based customized model. and additionally the one everyone talks about “Data-driven attribution” model, which is customized attribution model based on statistic and economic rules relying on your customer journey statistical analysis. Make sure that this attribution question is really relevant to your business and to what extend before starting The basis of attribution model is to understand which channel contribute at which extend to your conversions/revenue ; but what if 80% of your conversions happen on a first time visit with only 1 channel involved, what if you had only 3 touch points in the whole customer journey? What is you have 5 different path to purchase ? Depending on your business model, those questions will be relevant or not : make sure your ask those anyway. as this may totally throw off your model and inherent analysis. Be conscious of the data you are collecting, are they enough to pull a model together : do you already have a unified view of your customer journey or are you using 5 different tools to measure? In a perfect world, you need as much data as possible in the same environment: from TV influence to social media, to paid media to retail sales or online sales without forgetting mobile experience or emailing… But as said you can start small and improve it ! try to map it either via digging into your data or looking at benchmark or asking your client directly before kicking off – there is no need to start from scratch or copy what others do, you have already a wealth of data at hand to learn from ! LEARN from existing dataset, TEST and LEARN and OPTIMIZE and TEST again ! What about you ? What’s your POV? Did read any nice article, whitepaper, webinar… about Attribution that should be mentioned here? In reaction to Google encrypting natural and now paid search queries in mass ; I know that Google do not care a minute of my POV but anyhow as in love I will not hold back my feelings anymore: angry and desperate ! Or am I just blind maybe, a lot says that it’s not a big deal that now 70-80% of the keywords are displayed “Not Available”… I mean, really ? I know it’s not the end of the world: keyword performance analysis is not dead – Third party PPC management platforms & Google Adwords are not affected but my point of view here is only analytics platform focus. I love new challenges and evolution is key. But I kind of like having all my stuff in one place, sure I don’t mind bringing some external fun from time to time in my routine but most of the time it’s easier to have everything in 1 place and I rather spend time analyzing than doing data enablement, but that’s just me. My place being my analytics reports/dashboard Omniture or GA and external fun being Google Adwords & Google Webmaster Tool, and it’s getting more difficult to analyze without making too much assumptions. What happened and What does it mean? Today, we are extending our efforts to keep search secure by removing the query from the referer on ad clicks originating from SSL searches on Google.com. The gist of the development is that when people using secure search click on AdWords ads, the user’s search query in the referrer string — the actual words that people entered into the search box — won’t be passed to analytics packages and third-party software. They’re going to be stripping the paid search keyword from the URL, which is how adobe/google analytics collects the data. You can access paid keywords in adwords or via their API. it will not be available in google analytics or adobe analytics. Well, I think it’s clear – Analytics vendors will not anymore have access to keywords the way they used to ‘via the referrer string’. But let’s be very clear, it doesn’t mean that natural search or paid search won’t be identified as what they are – it means that keyword level analysis from an analytics perspective won’t be easy. When before you looked at your branded keywords, top keywords, long tail keywords… against your bounce rate, engagement & conversion rates ; well.. you just have to stop doing that. Looking at landing page report and deducting from there; knowing that most of the time your landing pages are optimized for a specific list of keywords – we could in a way extrapolate from this using either custom variables or classifications to tag each of your page in a set of topics. Looking at Google Webmaster Tools; knowing that Google Webmaster tools reports displays the volume of clicks and impressions by query. Unfortunately this is limited as you can’t drilldown this report with your site objectives and KPI only again geographic data and you can’t segment either. In summary for natural search, no changes here – stick to your routine except #3. And appreciate that this change brought a change of perspective shifting towards more user behavioral, user segmentation/personae focus instead of keywords only. Still, i don’t think it hurts to have both. As for paid search, what should we do now? Well, I would suggest that we go on strike ! but being realistic I believe we just need to adapt as indeed it’s not the end of the world – search vendors as still working perfectly – you can have your data from Google Adwords or your third party PPC management platforms, but i had to complain first ! Aside from the list above which is applicable for paid search as well (#2 use Adwords instead of Google Webmaster tool in this case) ; Google advise as well that for generating reports or automating keyword management with query data, use the AdWords API Search Query Performance report or the AdWords Scripts Report service and alternatively use ValueTrack parameters. ValueTrack parameters in a few words ; this feature allows to dynamically populate the keyword into the destination URL; the keywords not the query the users typed but if you include also the match type parameter (broad, exact…) you will have a close idea of the query. In this example above, the parameter capture is the device type, but any other parameter can be appended. See below exhaustive list and click ont he image to be redirected to the methodology. What about you? How do you intend to deal with “Not Provided” growth? Hope you enjoy the reading, please share if you did ! SLC Adobe Summit 2014, analytics review. The Adobe Summit in Salt Lake City is just over, although I wasn’t there the wonderful magic of internet & video allow me to pick up on what I missed and share with you the analytics pieces ! You can find all the 23 sessions of Adobe Summit recorded here as well. I had to make a choice so 2 sessions really picked my curiosity and get to the point of having me writing those lines for whoever don’t want to listen to 2 hours of video. was led by Jeff Allen, Adobe and Mihai Anghel, ThinkGeek. I found this one quite interesting as it’s an everyday challenge: moving from the left side of this chart to the right side. It gets really frustrating to spend that much time of the left side if it, but it has to be done perfectly so that you are trusted when delivering insights, prediction and segmentation pattern based on those left side figures. Those insights are what makes your work valuable and finally help driving the business.
. I understand this seems hardly fun but it’s a really hot topic from which organization can gain for, I still believe that it’s fancy and maybe too fancy when some organization are missing the basics but each things has its time and attribution fall into the high level of maturity in analytics practice. Especially knowing that the user journey is across devices, platforms, media… the equation is more and more complex at some point we need clarity to understand what is influencing what, which media goes first in the path to purchase, correlation and causality, which media drives awareness, consideration, engagement or conversion… To go beyond the last click model as stated before attribution role is to uncover this mix. The focus of this session was to go through Models available for attribution and as expected pointing the one that should be THE ONE. – Less to More: when the first touch gets 10 the last one gets 50 for instance. 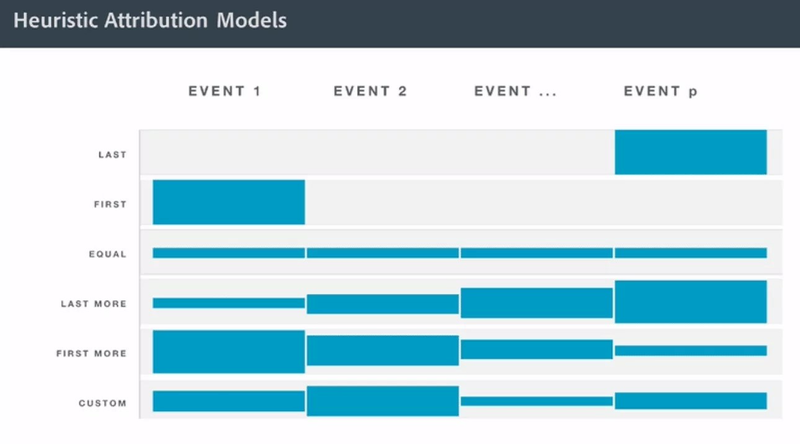 The rest of the presentation went through the Top Down Attribution model of Shapley, which is a statistically based on historical data model for attribution. One of the hint of it was that you’ll have to calculate your marketing channels elasticities – i.e. the relative effectiveness of a media channel to drive sales on a given point of time. And especially as this formula will be relying on YOUR historical data, you better have a statistician with you ! It’s highly mathematical with words like regression line, variance, formula, equation… and so on ; so I leave it to you to watch the video if you are a statistical person. For other people like me, my interest was more into practical examples, the case study was according to me a little bit disappointing as the only output you see during the session is : “Thanks to this model, if you spend 18% in Email, you’ll have 30% sales” ; which is good insight for media planning don’t get me wrong. My disappointment came from the fact that I was missing step and by step or how-to guideline, proofs and multiple case studies instead of one. At last, I still think that it’s hard to get started ; good thing is some tips are raising interesting question for me as “Get your data ready for attribution” ; I believe this is the main focus for now. Other than those 2 sessions, some others tweets I went through or video sessions I scan briefly raised other nice stuff to follow, such as using R to access Adobe Analytics APIs or knowing that now Genesis is Free or Ben Gaines SiteCat Tips & Tricks session. I’ll may dig into that later and let you know ! Stay tuned and if you like this article, please don’t be shy… Share ! Terrible metrics, How NOT to bang your head against walls ! Literally, you want to go back to sleep (at least I do) or slap someone with your dashboard – true story, I am quoting someone who actually told me that ! So, before you hit the PANIC button and scare the hell out of you HIPPO (Highest Paid Person in the Office or Boss or Client) ; take those 3 advices into consideration. Business Objective is your compass – either macro business objectives or micro page-level objectives! Like when you are cooking, one ingredient is not sufficient on his own, well when evaluating your performance 1 metric on its own is not sufficient. This metric has to be put against your objectives and some context. If for instance you look at Time Spent on Page ; the gap of performance between 2 pages can be puzzling at first ; though against the page main objective you’ll not evaluate the results in the same way. If Page A is an article you wrote with a video for instance while your Page B is a form subscription ; you’ll know that Page A type of page objectives in engagement hence the longer the time spent the better and you may look at content velocity to cross check that it is effectively good while Page B type of page is conversion hence a long time spent on page will not be a metric you care about except when it’s a sign that your users are having issue to convert and in that case you’ll be looking at form completion rate to cross check the performance. I believe that each metric that you measure must have a real connection to your business objectives and tactics to achieve them, and has to be mapped out to a measurement logic where business objectives come first and are turned into KPI which are measured by some metrics for which you have set targets against. The granularity doesn’t have to be the page level each time but it’s by defining methodically your objectives, how to measure them etc… that you will know what each metric you have in your dashboard is for. With this logic applied to real business objectives, you’ll know why you need to dig further, panic or wait and see. Reduce the noise: Segmentation is Queen! If we take the example of the channel drivers performance, one channel cannot be compared to the other without considering the users journey & your sector. Each channel contribute to a different moment of your user journey hence each channel may not perform the same for your general key metrics but each channel will have specific goals and metrics attached to it. Another example related to your user journey would be to segment by user type. 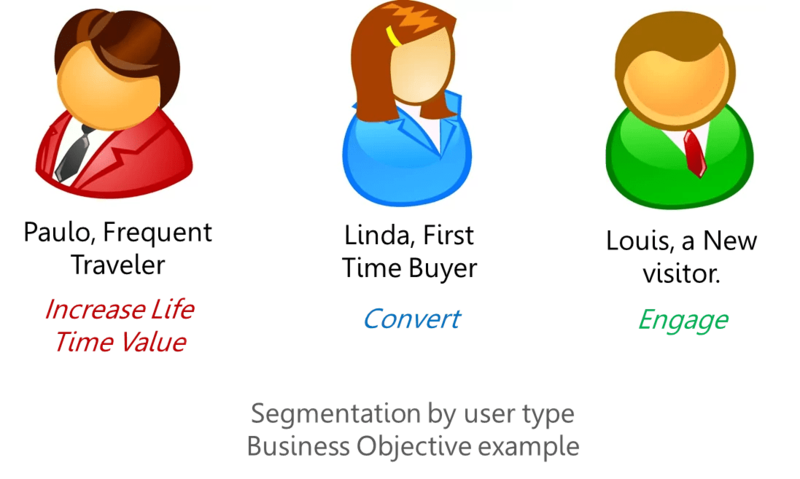 Your company may use Personae to define user type, those personae can be considered as segment in your analytics tool. If we take the example of a travel website ; the same objectives, metrics and targets will not apply to Paulo, Frequent Traveler than Linda, First Time Buyer or Louis, a New visitor. “Benchmarking is the process of comparing one’s business processes and performance metrics to industry bests or best practices from other industries“. 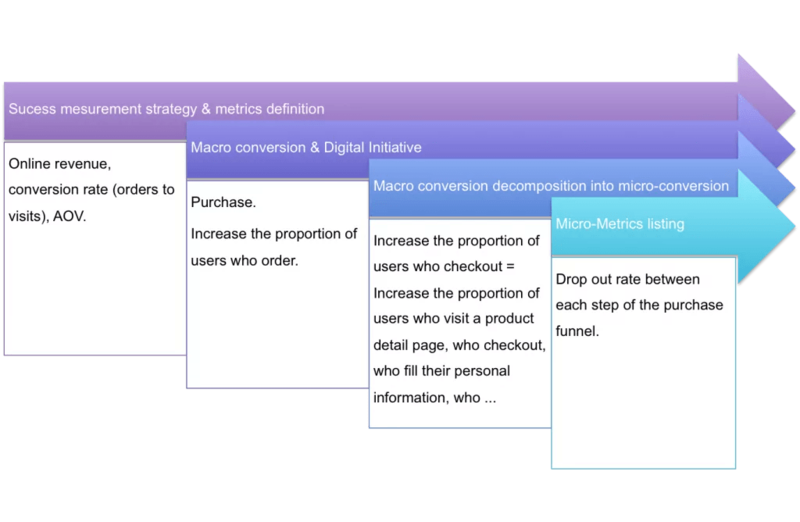 From my usage in a digital analytics context, there are 3 types of benchmark : historical data (looking at your trend), Target data (looking at your objectives) or Competitive data (when industry benchmark are available). Benchmark data are also here to give you some perspective !